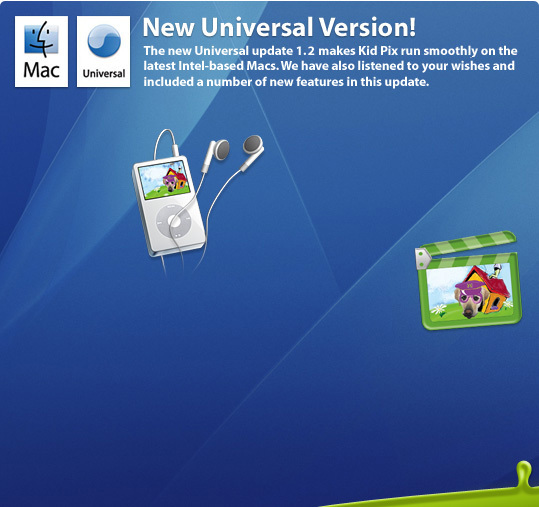 Kid Pix projects can now be exported in iPod Video format! The video file will be automatically placed in a Kid Pix Videos playlist folder in iTunes. Just drag it to your iPod and play! Create your own music for Kid Pix projects! Make a sound track in GarageBand and then import it directly into Kid Pix. No need to be limited to smaller font sizes - set virtually any font size you want for letters in your Kid Pix projects! Now you can resize objects made with the Scissors tool shape options to get just the look you need. Choose between the legacy iMovie® and modern iMovie HD formats when exporting to iMovie - great for iLife’05 and iLife’06 users! You can also browse folders that you’ve made in your iTunes and iPhoto® libraries! projects advance to the next slide after the sound attached to the current slide finishes playing.